Rosemary is one of the most beneficial herbs for your hair. I have been using rosemary hair rinse for about 3 months now. I am not sure if it has changed the colour of my hair – I henna dye every month – but it surely has changed the colour of my white tumbler (which I use to pour the rinse) to light brown. Although, I see lots of tiny new hair sprouting all over my head recently. And I also noticed that I am shedding less hair. Rosemary contains ursolic acid which helps to increase scalp circulation – this means more oxygen and nutrients will be sent right to your hair follicles, and that in-turn promotes healthy hair growth. This aromatic herb has been traditionally known to darken gray and also slow the appearance of grey hairs. Due to its high antioxidant content, it scavenges free radicals and hydrogen peroxide, which are responsible for greying as well as hair thinning. Rosemary also revitalizes hair, removes product/cal build up to leave your hair shiny and soft. This wonderful herb offers strong antimicrobial, anti-inflammatory, and antiseptic effects. Plus it’s showing promise against candida albicans – a type of yeast which causes dandruff. And therefore it’s a useful home remedy for treating dandruff, itchiness, and scalp irritation. 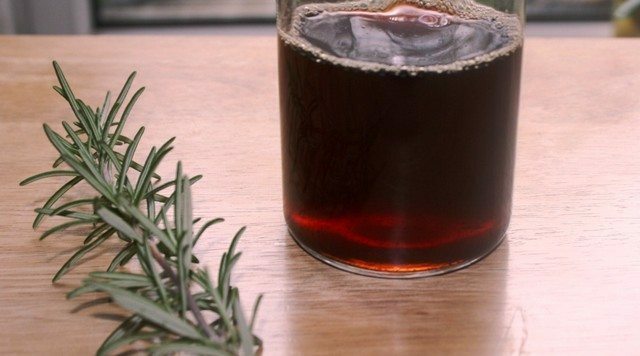 Drinking rosemary tea is said to improve the memory. In olden times rosemary was referred to as remembrance herb – sprigs were given to loved ones setting out on journeys or carried at funerals as a symbol of love and happy memories. This ancient herb also calms the mind and lifts the spirits – it actually acts as an anti-depressant (Although, don’t substitute it for your medicine). This recipe is very easy to make. All you need is rosemary and water. You can also add other herbs such as thyme, lavender flowers or marshmallow root for extra boost. Bring the water to a boil, then add rosemary leaves (and thyme, lavender flower or marshmallow root). Then reduce the heat, and simmer, covered – to avoid the loss of volatile oils in the steam – for 2 to 3 minutes. Remove from the heat and let it sit in the pot to cool. The water will turn a dark brown. You may see an oil film on the surface, and that’s ok – it’s the rosemary oil. Strain out the rosemary, then add the lavender essential oil (if using) and stir to combine. Use as a final rinse over the hair. Slowly pour the rinse over your hair and catch the drippings in the mug/pot and keep pouring them through your hair until they are all used. Massage the infusion into your scalp and hair and let it sit for 10 to 20 minutes. Then rinse thoroughly, or you can simply leave it on until the next wash. This stimulating rinse will help condition both hair and scalp. Post exercise rinse: If you exercise frequently or sweat a lot due to weather conditions, skip shampoo and use this rinse to keep your hair smelling fresh and clean. I use this rinse or this one 2 to 3 times a week, either after a homemade shampoo (I prefer hair rinse to a conditioner, which I haven’t used in ages) or post exercise. This nourishing rinse adds shine and body to my fine hair and it’s also soothing and refreshing to my scalp. And I love the way my hair looks and smells. Store the remaining: This quantity should do at least 2 to 4 applications depending on the length of your hair. Store it in the fridge between uses – it will keep good for up to two weeks. If it’s freezing cold and the middle of winter, add some hot water to warm it before use. How long will it take to darken my hair? You won’t get the results overnight, as the colour will darken quite subtly and naturally. You should be able to see noticeable changes in 2 to 3 months time. I have read several places that if you do not rinse it out you will be able to see faster results. I have never tried leaving it on, but if you do, I would love to hear how it worked for you. What other herbs can I add to this hair rinse? This will depend on what effect are you looking for. Below I have listed down herbs according to their qualities. So when you are making a hair rinse, make sure you are doing a balance of conditioning and astringent herbs. For dry hair use more conditioning herbs and for oily hair use more astringent herbs. Hi! Love your article. I tried this rinse for the first time today and will continue to do so. I would like to know if you have any knowledge about using tomato as a hair mask. My mother and grandmother highly recommend it, but can I alternate it with the rosemary rinse? I have devoted sticky hair, ends sticky, diagnosed as age and hot water related sebbhporia dermatitis, Sick of using the allopathic shampoos, a homeopath recommended Rosemary rinse, Any ideas and info. Hello Robin, I would try rosemary hair rinse. The medicated shampoos don’t work for everyone. You can also give this homemade shampoo a try. Is rosemary oil safe to use on color treated hair? I recently darkened my hair and I don’t want to strip the color so soon. Thanks! I read to add cedar wood oil to the rosemary rinse, do you recommend and what is the benefit of it? Grey hair…i have read that prunes, ha…help delay the onset of grey hair also…as well as estrogen foods for females and testosterone foods for males and the u.s.a government pyramid diet…they forgot, drink plenty of water and exercise and salt and pepper and good oils, perhaps. Hi mihnaz, I have a question. Is it possible that rosemary bring back lost hair? I am becoming bald and want to use rosemary for regrowth. 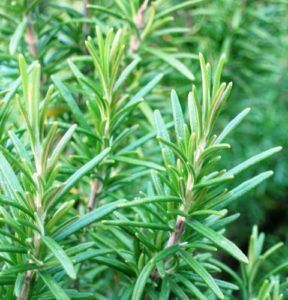 Hi Hossein, give it a try, rosemary is one of the top herbs for hair growth. Also, here are some hair masks that promote growth. Hi Minaz, woudl the addition of fresh lemon help as well? Thank you. Hi Mike, do you want to darken your hair or stimulate growth. What is your hair like? Can I mix essential oil with any organic hair serum, and then apply on hair? My hair is white and I don’t want to darken it. Will this rinse make it too dark? Yes it can darken your hair. Other herbs that don’t affect the hair colour are: lavender, marshmallow root, horsetail grass, thyme, nettle, basil, elder flower. I accidentally boiled dried Rosemary for 1 Hour when preparing a hair rinse. Are there any problems with this – health, nutrient value etc. Hi David, I am replying late. But it’s okay to use it. What did you do in the end? Hi I just wanted to confirm that it is ok to mix rosemary, thyme, lavender, and sage together. I grow those herbs but haven’t found combinations of thyme and sage together for hair rinses. Hoping to do a hair rinse that will maximize hair growth. Thanks! Hi Sarah, Yes you can try that combination. You can also add some lavender to it. The best way to decide what rinse is best for your hair is to try various combinations 2-3 times. And record every time how your hair feels. Put date, combination and amounts. And you will soon know what works best for your hair. Thanks so much! I will add thyme in today. I hope I am able to grow hair back. I also wanted to ask what you think of high frequency treatments? so when I used fresh rosemary i got a light yellowish color when I was done. Should i have left it in longer to get the deep red in the picture? Hi, great article! I have very thinning hair and a hair dresser recommended I try using Rosemary Oil. Can I buy this from you? Is it called Majestic Pure Rosemary Essential Oil? Can I also purchase the Rosemary Rinse from you as well? Thank you for sharing this information and I look forward to hearing from you soon. hey , Minaz. How are you ? i want to darken my hair plus want to increase my hair length. plz suggest me some tips. Hi Minaz. Thank you for sharing your experiences. Can I just use rosemary oil which is available in stores like vitamin shoppe etc.. instead of preparing rinse.. Thank you for your time. Yes do give it a try, although it will not have the same effect. Hema Das, did you even read the article? Yes, try local herbs and see what works best for your hair. I made some rosemary water from my plant in yard. How long will it last. Does it become rancid? It will last about a week. You can freeze the remaining in ice cube tray. hi! i use rosemary oil on my hair and i’m very happy with it. problem is i don’t want my hair to get darker. is there some oil or something i can mix with rosemary oil so that it’ll syop darkening my hair? Yes rosemary can be drying for your scalp. You can use licorice (jeshtamadh/mulethi) or marshamallow tea to rinse your hair. Yes, I read 10-12 articles about Rosemary and they said that Rosemary is astringent in nature, so it can be drying. So it is recommended to use ACV in it. That is in ratio 2:2:1 (water, dry rosemary and acv). Also, can you please suggest the best brand for dry rosemary leaves? And reply to the lemon peel and water part too(I know I asked in wrong post, then even). Can Rosemary in anyway be drying to scalp? And I have dried Rosemary leaves they give a yellow-greenish kind of brew not black. Which brand would be the best for buying Rosemary leaves? As fresh aren’t present in my locality. I am using just organik right now. I read your post regarding using lime peel rather than the lime juice( if using on regular basis) , right? So, how regular you were talking about there? Ps. Lemon juice did make my hair kind of rough. How to treat hot water affected scalp? I mean I have got a flaky dry scalp because of hot water. So how to treat it? Pps I love your blog. Reply? Nice post dear. Can you please tell which are the best herbs for hair rinses that can support regrowth of hair? green tea, rosemary, and licorice (mulethi) are good. Just switched to your home made shampoo. I am finding it difficult to get black tea leaves but have seen black tea bags.can I use tea bags or can I use regular tea leaves. Hi Marianne, yes you can use regular tea leaves. Hi Hair Buddha, good and easy recipe for hair rinse. I’m desperate to regrow the hair I lost and started to use Rosemary e.o. with Castor oil and massage it into my scalp. Unfortunately I kept losing even more hair and finally stopped when my doctor friend warned me about applying oils on the scalp. She explained that OILS open hair pore and weakens the hair follicle, thins existing hair, and thus causes more hair loss. She warned me to stop using the oil on my scalp. I do remember my mom and grandmother swearing that Rosemary treated hair loss so I am hopeful that a water rinse won’t dilate my hair pore and loosen it. I even thought about making a puree with fresh rosemary and applying a hair mask on my scalp to get the benefits. What is your advice? Thank you. Hi, Castor oil is very thick and that can cause a drag and stretch your hair roots. You can instead use almond or jojoba oil. Thanks for your reply Minaz. I put my hair tonic in a spray bottle and apply it to my scalp with a gentle massage and also spray length of hair after I shampoo and towel dry my hair. I also like to spray my hair with it before & after I go the gym and at bedtime. I added Rosemary E.O. and Lavender E.O. to my hair tonic as well and omitted the other oils in the recipe. In the future, I will add the horsetail too because it contains Silica. Thanks again. Black tea powder instead of leaves. Whenever u talk amla, is it fresh or dried or powder? Which is the best concoction for use as shampoo to totally avoid shampoo but still need clean and fresh scalp and hair! Can you use rosemary, black tea leaves,amla powder, sage powder, orange peel powder & licorice powder? What is the quantity for each and if I am using some of this in the powder form, when do I mix it after the water cool or before? Thank you. Sumy, that’s a good combination. But, don’t use orange peel powder if your aim is to darken hair colour. Also, start with just 2 or 3 herbs, and keep adding, so you know which is working and which is not. You can take 1 tsp each and mix everything together.